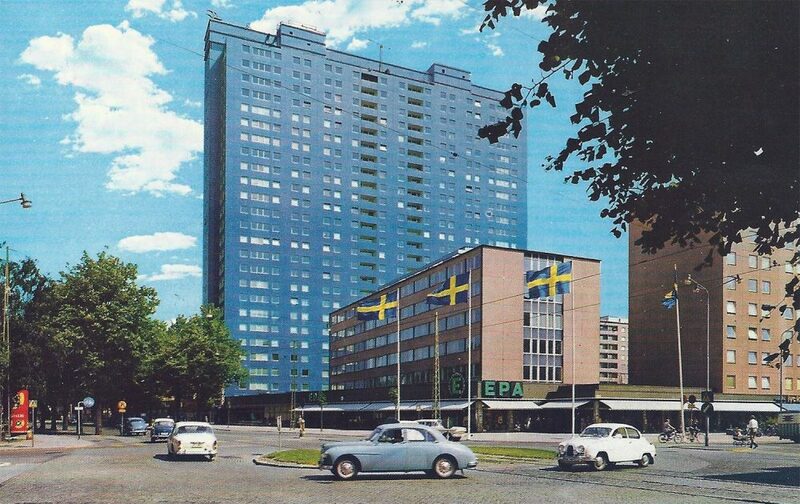 Malmö’s first skyscraper (and one of Sweden’s earliest) was built in 1964 and namned Kronprinsen (The Crown Prince). It stands 27 floors tall and features 700 apartments which can house as many as 3 000 people. The cost of building it was a staggering 90 million SEK (approx. $12 000 000). Standing at the top of the building, on the visitors terrace, one could see all the way over to Copenhagen on clear days. Using the binoculars placed there for viewing pleasure, you could probably also see right into the famous SAS-hotel designed by Arne Jacobsen. Using the high-speed elevators allowed you to speed to the top-floor of the Crown Prince in only 30 seconds where you would find the posh restaurant Översten (The Colonel) with its swank sky bar designed by NK, the restaurant is still operational today. At the base of the skyscraper a shopping and sports center was built. The residents of the Crown Prince were probably never meant to leave their homes. Everything they ever needed was located a few feet from their apartments, including a 14-lane Bowling alley and Tennis Courts. But what about your car? It is parked in the huge underground garage which can hold up to 1,300 cars. It was one of the biggest underground garages in Scandinavia at the time. Times has changed since 1964, taller skyscrapers has emerged – but Kronprinsen is still the Crown Prince of Malmö.